Inexpensive housing options hold plenty of appeal, but no-one really wants to sacrifice the cool stuff. Architect and artist Ty Kelly created this amazing example of a tiny house in a prairie in Montana that's not a compromise. 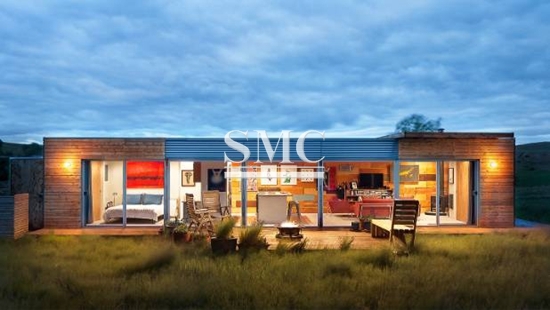 It's made from two shipping containers, and Kelly recently put it on the market for US$125,000 (NZ$169,000). He tells Stuff there was "a ton of interest". "My realtor said he'd never had his phone ring so much. I think it actually started to wear him out. What I found interesting, was how many people called from afar. There were folks from all over the country (including the East Coast and Los Angeles) who actually considered moving it that far. To me, it seemed very impractical (and expensive) to transport it that distance, but I was open to ideas. In the end, a great woman just down the road about 10 miles ended up with it." "Being an architect, I was always fascinated with shipping containers as a way of building, even before it was a popular thing to do. For the shape and size of house I wanted, containers were the perfect building module. Economy also played into the equation as well as recycling and reuse of material, which was a big component of the project." Kelly chose the perfect site for his build, prairie land he calls "big sky country". "There are wide open views, with three different mountain ranges in all directions, mes of rolling prairie, blanketed with native grasses, and with zero light pollution, the starry nights are truly unbelievable."